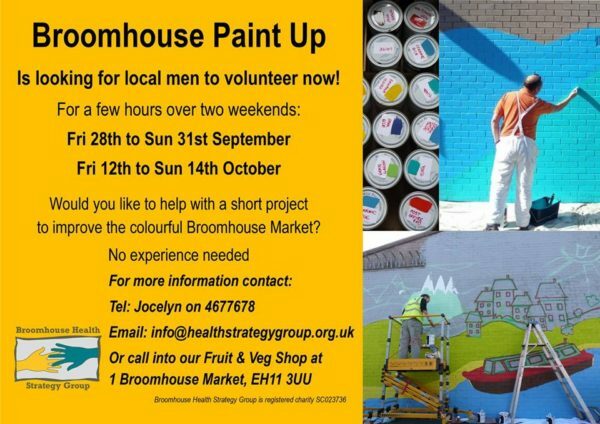 Broomhouse Health Strategy Group are looking for local men to join them for a Broomhouse Paint Up, a short term project taking place over two weekends to improve the colourful Broomhouse Market. The project aims to tackle social isolation by connecting with men who can be hard to engage through mainstream health and wellbeing activities, as often these services are seen more as catering for women. No experience is needed. For more information contact Jocelyn on 0131 467 7678 or info@healthstrategygroup.org.uk. You could also pay a visit to the Broomhouse Fruit and Veg shop, 1 Broomhouse Market, and speak to a member of staff.